A Blog about the life of Joey, an active JRT: Putting a dog to sleep? Kindness? I was born in an unknown farm in Melbourne, Australia on 5th August 2001. 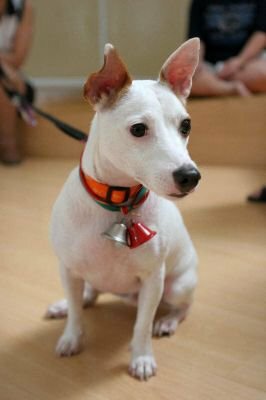 Now I lived in Singapore with my human companion (HC) and an old, abandoned JRT cross known as Jack. Since Feb 2003, I am with the Singapore Civil Defence Force as a Search & Rescue canine volunteer. I also love retrieving balls and agility. Putting a dog to sleep? Kindness? We (human and canine) were trying to take a Sunday afternoon nap when HC received a call from a friend. Apparently, this friend's brother is going through a divorce with his wife, and the wife demanded him to remove their blind dog as she does not want him anymore. The friend's brother is also at a loss, as he does not have his own apartment for now, and is lodging in somewhere elses' home. So the question made to HC's friend was... " is it kinder to put the dog to sleep?". HC was really pissed off with the attitude of such owners. They are fighting over a list of assets and child custody.. but the dog is not in the 'wanted' list. She has came across so many of such owners over the years. Lovey dovey new couples get together and decides to get a dog with reasons like "it completes the family" or "seal their committment to future lives together." blah blah blah. A few years down the road, when their relationship breaks down, or they have a new baby - the once coveted dog is now cast aside. If the dog is lucky, he probably still get fed and short 5 min walk, if not the dog may be abandoned or rehomed. For this case, HC truthfully told her friend (not the dog's owner) that it is not easy to rehome a blind dog. After much persuasion, she sorta managed to advise this friend to offer to temporarily take care of this dog, and when his brother finds his own apartment - he could returned the dog to him. There are lots of dogs who are in such situation, and I hope that potential dog owners think twice before getting a dog cos having a dog is a lifetime committment! There goes our afternoon nap - HC simply couldn't sleep after hearing this case.